Towards the end of a long and distinguished career, Sir Fred Rosier was persuaded by his son David to write his autobiography. He did so and the result is an extremely engaging and enlightening account of his life to the end of the Second World War and beyond . Born in Wrexham on 13 October 1915, son of E. G. Rosier, a railway engine driver, Fred Rosier was educated at Grove Park School and played rugby for North Wales Schoolboys. He received a Short Service Commission in the RAF in 1935 and served with 43 Squadron (Fighters) flying Hawker Fury aircraft at Tangmere from 1936 to 1939. He was a flight commander on No. 229 Squadron RAF (Hawker Hurricane aircraft) by May 1940 having helped form and convert the squadron from the Bristol Blenheim aircraft. He first saw active service during the Second World War in France where he commanded a detachment of 229 Squadron at Vitry-en-Artois near Arras and was shot down by an Messerschmitt Bf 109 receiving facial burns. Returning to active service by October 1940 he commanded 229 Squadron from RAF Northolt for the last 12 days of the Battle of Britain. [He embarked with 229 Squadron for North Africa on board HMS Furious and led the aircraft in a takeoff from ship to North Africa via Malta. Promoted to Wing Commander in 1941, he took charge of No. 263 Wing where he had joint operational control of the Desert Air Force’s fighter squadrons. In November 1941 he spotted an Australian Tomahawk aircraft being forced down by enemy fighters and landed his single-seater to rescue the pilot. Having got Sgt. Burney aboard he attempted to takeoff but suffered a burst tyre and crashed the aircraft. Both he and Burney walked across the desert for four days, avoiding large enemy patrols, to reach safety with a Guards unit. Rosier became the deputy commander of No. 211 Fighter Group and was awarded the DSO. Returning to the UK in 1943 he became Officer Commanding No. 52 Operational Training Unit and then Commanding officer of RAF Northolt. He was appointed Officer Commanding RAF Horsham St. Faith in 1947 and then went on an Exchange Officer posting with the USAF in 1948 and on return to the UK was appointed an Instructor at the Joint Services Staff College in 1950. 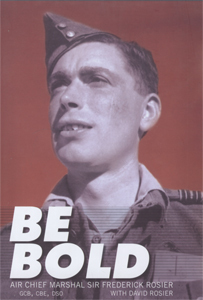 He went on to be Group Captain Operations at Central Fighter Establishment in 1952, Group Captain Plans at RAF Fighter Command in 1954 and Aide-de-Camp to the Queen in 1956. [He was made Director of Joint Plans at the Air Ministry in 1958, Air Officer Commanding Air Forces Middle East in 1961 and Senior Air Staff Officer at Headquarters Transport Command in 1964. His last appointments were as Air Officer Commanding-in-Chief at RAF Fighter Command in 1966, as UK Permanent Military Deputy at CENTRO in Ankara in 1968 and as Deputy Commander-in-Chief Allied Air Forces Central Europe in 1970 before he retired in 1973.